It is not often that you hear about Syria outside of the context of war, refugee crises or terrorism as the country plunges through relentless years of political unrest. However, despite the chaos and war atrocities, Syrians adapt, live and make art. 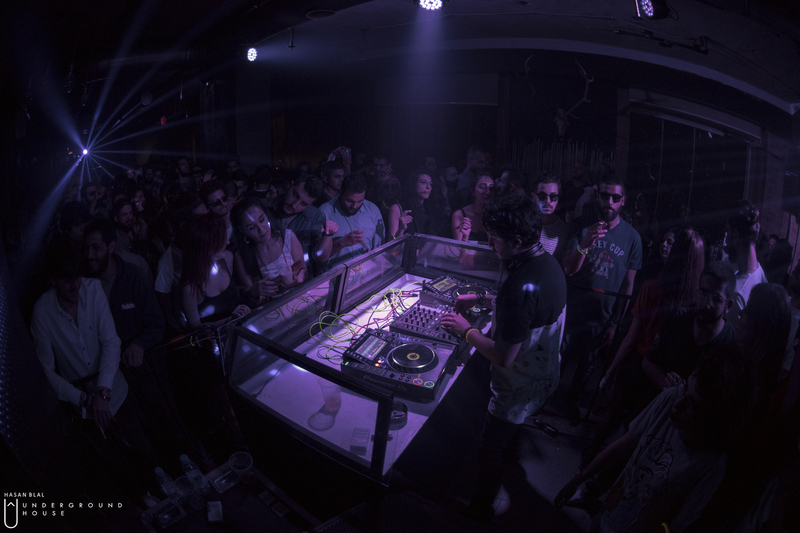 We speak with Saadé Khoury and Mahdi El Laham, the founders of Underground House Syria, the leading electronic music event organization in Damascus, in order to shed light on the growing scene that you’ve probably never even knew of. Underground House was created originally by our resident local DJ Saadé Khoury in Tartous, Syria. The scene in Tartous, which is a small town, wasn’t that big; it was just a few people who listened to electronic music but weren’t necessarily into underground party scene and it’s for that reason that Underground House moved its activities to the capital with a new team. Damascus already had a non-professional electronic music scene after the war, created by a few local DJs. When talking about the music scene in Syria in general, a lot of new bands that play different kinds of genres have started to form and play gigs more and more. Local DJs are putting together small, independent events in old Damascus and a few DJs from Lebanon play here, but those parties were highly priced for most people to attend. That’s where our part comes in. Most of our venues are in the middle of Damascus. Hosting a party inside the city is hard, because we have to think about the nearby houses, the venue’s closing time and the area and shops around it. It’s more complicated in less developed Arab countries to introduce unfamiliar things to the population, especially after a war - because there are no specific rules that define whether something new is acceptable or not - until it’s not. These electronic music events are still a vague concept, because of their new and unfamiliar nature, but they are without doubt very frowned upon. It’s not about all the other things that come with those events, it might simply be about the fashion style of the crowd, or the fact that a party starts at 9PM and ends at 7AM. It’s different to what people consider ‘normal’ around here. We think that this scene will face more and more obstacles with the popularity that it is going to gain, at least for a while. "You cannot possibly sleep to the sound of bombs and start your next day with Vivaldi’s The Four Seasons." After the war, the overall art scene in Syria shifted to a darker, more melancholic place, with visual and performance artists making their themes more and more about the war and crises. With that, the general artistic taste in Syria became darker. That in itself might have attracted people - especially the young crowd - to music that is faster and darker. We’re not trying to psychoanalyse people’s musical tastes, but you cannot possibly sleep to the sound of bombs and start your next day with Vivaldi’s The Four Seasons. This is a parallel project with another project that we are currently working on. Our main aim is to create a platform where new artists and electronic music producers can find a place to develop and enhance their skills. We have a small equipped home studio that we offer to local DJs and producers for free, as well as to all kinds of musicians and bands. From this first step, we are aiming to expand our platform and host international DJs and musicians. In the end, it’s always about music, and music is not just for parties. Our approach has always been about putting some ground rules of event planning and music promoting, for the benefit of all the people who are really passionate about music, because we were and are those people. We just hope that it’s going in the right direction.